Occurs at elevations above the tree line. Starts at 10,496 up to 13,120 feet (3,200 up to 4,000 meters). Nightly frosts. Between the temperate Montane valleys and the snows of the highest peaks stretch high-altitude grasslands characterized by chill mists and low, spongy vegetation spotted with sharp grasses and shrubs. Located in the Andes mountains in central Ecuador, Cotopaxi is one of the highest active volcanoes in the world. Cotopaxi which means “neck of the moon”, rises from a valley about 2,750 meters (9,000 feet) above sea level to a height of 5,897 meters (19,347 feet) above sea level. The width of its crater from west to east has been estimated at more than 500 meters (1,650 feet) and the width from north to south at about 700meters (2,300 feet). The perfectly formed snow-covered cone of Cotopaxi is 1,341 meters (4,400 feet.) high. Chimborazo Volcano is located on the Western Cordillera of the Andes in central Ecuador, 150 kilometres (93 miles) southwest of the capital, Quito. 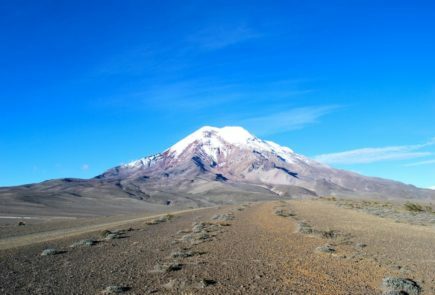 Chimborazo’s majestic summit rises 2,500 meters above the surrounding highlands (3,500 to 4,000 meters) with a 20-kilometer wide base. The Chimborazo is covered by perpetual glaciers and snow. The Chimborazo is a Quaternary volcano that has not erupted in historical time. Elevation of the summit is 20,700 feet (6,310 m). The summit of the Chimborazo constitutes the farthest point from the center of the Earth – because it is just one degree south of the equator—and our planet bulges at the equator. The Chimborazo is featured on the Ecuadorian Coat of Arms, to represent the beauty and richness of the Ecuadorian Highlands. It is the sacred mountain, the protector of the Andean peoples of Ecuador. The Chimborazo is surounded by the “Reserva de Produccion Faunistica Chimborazo.” which forms a protected ecosystem to preserve the habitat for the Andean camelids: vicuña, llama and alpaca.